As more gas wells are drilled in Pennsylvania's Marcellus Shale, more cases of toxic spills are being reported. Earlier this month, Pennsylvania's environmental officials fined Pennsylvania-based Atlas Resources after a series of violations at 13 wells, including spills of fracturing fluids and other contaminants onto the ground around the sites. And just last week the agency fined M.R. Dirt, a company that removes waste from drilling sites, $6,000 for spilling more than seven tons of drilling dirt along a public road. The reports come on the heels of a string of other incidents that have killed fish in one of the state's most prized recreational lakes and released toxic chemicals into the environment. The Atlas spills are significant because they are among the latest and because they happened repeatedly during the routine transfer of fluids. Pennsylvania's Department of Environmental Protection fined  Atlas Resources $85,000 for the offenses, which took place between May and December of 2009. Many of the spills were discovered by DEP inspectors. The violations  (PDF) cited by the DEP include spills of fluids from the hydraulic fracturing  process at seven sites, and failure to report a spill at one of those sites. 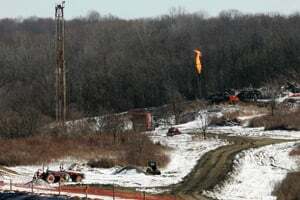 One spill was the result of a faulty pit liner, which is supposed to insulate the ground from hydraulic fracturing fluids after they are pumped out of a well. Atlas Resources  controls more than half a million acres within the Marcellus Shale, the massive gas deposit that stretches from Tennessee to New York. The company, whose total revenue was $787.4 million in 2008, issued a statement acknowledging that it had entered a voluntary settlement with the DEP and saying that each of the incidents had been corrected. An Atlas spokesman declined a request to answer additional questions about the violations, or about the company's operations in Pennsylvania. "If you look at this series of violations -- it's not only that there are multiple violations," said DEP spokeswoman Helen Humphreys, pointing to the fact that the same three violations were turning up at each site. "This is a pattern, and it's a problem." The pattern, and the problem, extend beyond Atlas. In December the DEP fined  Chesapeake and Schlumberger, two of the biggest operators in the Marcellus Shale and in gas development nationally, for spilling hydrochloric acid, which is used for hydraulic fracturing and is corrosive. Cabot Oil and Gas, a Houston-based energy company that lists T. Boone Pickens as one of its stockholders, was fined in November  for a series of spills, including a fracturing fluid spill by its contractor Halliburton. In October Pennsylvania fined  (PDF) Texas-based Range Resources $23,500 for spilling nearly 5,000 gallons of wastewater, including hydraulic fracturing fluids, into a tributary of Cross Creek Lake, a protected watershed near Pittsburgh that contains some of the state's most robust fish populations. The Range Resources spill occurred on May 26, when the company was pumping fluids from the hydraulic fracturing of three wells through a six-inch pipe to a DEP-approved impoundment. Along the way, two screws along the pipe came loose, according to the Range Resources report  on the incident, allowing thousands of gallons to spill onto the ground before the company was able to shut it down. Range Resources spokesman Matt Pitzarella said the loosened screws were a result of vandalism and that the company responded by increasing security at its sites. The fish killed in Cross Creek amounted to less than a pound of minnows, he said. Just three weeks before the fines were announced, Range was penalized by the DEP for another accident -- this time for spilling more than 10,000 gallons of flowback water, which again resulted in a fish kill and a substantial cleanup effort. A DEP spokesman said he could not comment on that spill, because a settlement is still being decided. "We find both of these to be unfortunate and unacceptable," said Pitzarella, who said that neither spill had any negative impacts on health or property. Unlike previous spills -- including the recent Atlas spills -- the DEP has not issued press releases for either of the Range Resources spills, and a spokesman has not explained why.